Beta twilight enemies from the 2004 trailer. Their polygonal models are still inside the game, and you can see them using some GameShark codes. Beta design of the Gale Boomerang. Also, in the beta you obtained the boomerang inside a chest. In the final version, you get it after beating the monkey boss. A beta Moblin enemy, completely removed from the game. The HUD was changed during the development of the game. In the beta version, it seems that it was possible to crouch and possibly crawl using the R button. A beta cutscene from the 2005 trailer, where Colin crawls through the secret passage that leads in the village’s spring. You can still go through that passage, but the scene was removed from the final game and the player needs to find it by himself. A beta sumo match from the 2005 trailer. This area was completely removed from the final game. In the occasions in which Link fights the Gorons, none of the battles match the one in this scene. In the final version, the rooms where the old Gorons are found have sumo looking platforms. Perhaps in the beta a sumo battle was necessary to win the key parts. In this screen from the CDG 2005 video, we can see another interesting scene: Links is escaping from a giant spider, through a dark cave. This scene was removed from the final game, but it was probably just a different Armoghoma Boss Battle from the Temple Of Time. This could even be the boss battle for the removed beta temple, that it was later changed and reused as Armoghoma; infact, in the same video we can see a lot of parts were Link explores the removed dungeon. A green chu chu jelly. As those who finished the game should know, you can mix the chu chu’s jelly in order to make potions with various effects. The green one is completely useless since the developers removed the magic system from the game. Normally, the green chu chu would recharge some magic. Unfortunately, Nintendo removed the green jelly in the PAL version of Twilight princess. Yet another beta enemy. it was unused in the game but was left in the memory code. It’s unlockable thanks to the GameShark. It was probably used in the temple of time or in the Twilight palace. With the gameshark we can even use the beta design of the bombs. They’re much more simple and similar to the ones used in previous games. Last updated by monokoma at 25-06-2013 . 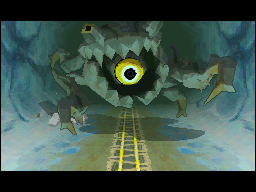 I believe they reused the giant spider in the tunnel in The Legend of Zelda: Spirit Tracks. I just thought that was an intresting fact and some photos to prove the simiartirs are ……. Hey, I really don’t see any beta enemy content, can I add anymore content for beta Zelda Games? I really like video games, but if you actually make the beta games, like Beta Twilight Princess, Beta Ocarina of Time, or Beta SM64, please send me some of them, so I can test them, okay. Because i havent seen it mentioned anywhere till i was messing around with actor replacement codes. Hi. I just want to let you know that there were also promises in the TP game that never fully made it like the extensive use of the oil lantern. In Link To The Past you had pitch black areas where you had to have the lantern in order to see though you did have some kind of electric torch where you could see directly in front of you for 3 meters but other then that you had to have the lantern. I got halfway thru the TP game and feel no urge to complete it as I was very dissapointed at it being dumbed down. Also they promised extensive horse combat which very little exists in the game outside of boss battles which is more forced making it less fun then finding out on your own. Sorry but I really don’t have anything positive to say about TP except for the intro when you press the *Power* button……………..not even the cover is inspiring. I feel it’s wrong only to give positive reviews for a product beause the whole purpose of a review is to help a user decide to spend or save their hard earned money especially in this tight economy where you need to pinch your pennies. Are people REALLY so stupid they need their hand held the entire game? I am sorry if my comment is off topic but I did a hard search on Google and other search engines looking for a relevant place to discuss the false promises of Zelda TP and I never found any. If my top message offends you owner of the site I am truly sorry but I do not see where I can post the topic without being yelled at so obviously I’ll be yelled at here or there and I just said “What the hell” and post.